Can’t afford a ticket to China to go visit the Forbidden City? Well, now all you need is your computer. IBM, which is a big believer in virtual worlds, and China’s Palace Museum have created an exact replica of the 178-acre Forbidden City. 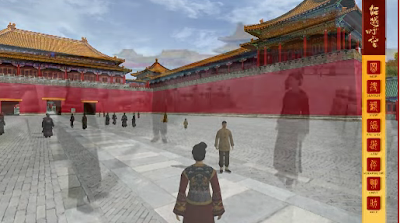 After working meticulously for three years to recreate every building and thousands of major artifacts, the virtual Forbidden City is now available for download (for Windows, Mac, or Linux). It’s free, although, I warn you the Mac version, at least, is a massive 275MB file. Once inside, you can choose an avatar, dress him or her up in Qing Dynasty-era robes, take virtual tours, play Go with computer-controlled characters, call up maps, explore buildings and objects that allow you to click for deeper information. The virtual world was built on a gaming platform from Garage Games called Torque. ( I guess OpenSim wasn’t good enough. No word on whether it will be interoperable with Second Life). So if you are looking for somewhere to weather out the current financial storm, but don’t have any money to actually go anywhere, you can spend hours roaming IBM’s virtual Forbidden City.